Every year, about this time, I start wondering if it's too early to start doing the "fall thing". Fall is my favorite time of year and I'm just so anxious to get out my decorations and start making some cooler weather dinners. Usually, though, if I start wondering now, I convince myself that it's too early. So I wait. But then life gets in the way and, before I know it, I'm putting up my fall decor super fast in mid-October so we have time to enjoy it before it's time to take it down and put up all the Christmas stuff. Well, I asked my son, Michael, last night what he thought and he said we should jump in! So here's my first colder weather recipe of the season: Broccoli & White Cheddar Soup. Usually I avoid things like this because I don't have an immersion blender and every recipe I find calls for one. Well, yesterday I got smart and used the awesome KitchenAid blender my mom gave me. 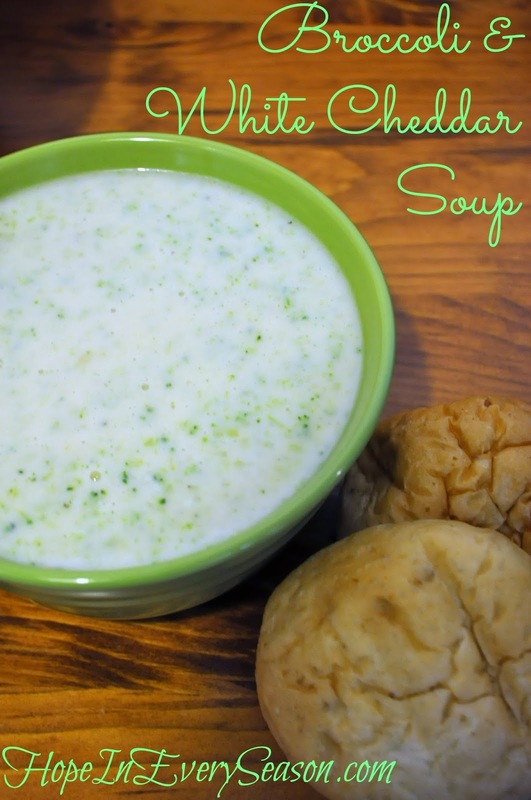 It was just one extra step, transferring the soup to the blender and back, but getting to taste this delicious soup was totally worth it! In a large skillet, heat butter over medium heat. Add onion, garlic, salt and pepper, and sauté a few minutes until onions are clear. Stir in flour and cook for one minute. Add broth, a little at a time, and works out any clumps. Then add the milk and stir. If your skillet is getting too full at this point, transfer the mixture to a soup pot. I had no problem with mine---I think it's a 12 c. skillet. Bring mixture to a simmer over medium heat and then add broccoli. Simmer until soup has thickened a bit. At this point, either use an immersion blender to break up the vegetable chunks, or transfer the soup to a blender, half at a time, to smooth it out. Return soup to the skillet and simmer another five minutes or so until it's the thickness you want. Remove from heat and stir in the cheese until it's all melted. I am so glad the blender worked well for you. This sounds so good. I love to make soup in the fall! I'm going to make this SOON!!! One soup I truly would enjoy anytime of the year. Oh yum! This recipe looks like a keeper. Thank you. I can't wait to try it. Your soup looks wonderful! I don't think it's too early for fall either! :) It's my favorite time of year too and I'm anxiously waiting for it to get here!!!! !